If anyone has read the 2000 word “trick leave” ordinance, they would easily come to the conclusion that it is written by lawyers for lawyers. The protections for workers are thinly-veiled land mines for employers to get tripped up on and land in court facing their employees, now their accuser. The “trick leave” ordinance allows employees to sue employers for retaliation, back wages and enter into class action lawsuits for violations of the ordinance including failure to maintain adequate records. The cost to Albuquerque businesses is estimated to be $111 million, according to the Bernalillo County Economic Development Department, but that number does not account for the additional legal fees for lawsuits brought by lawyers on behalf of aggrieved employees. And making it doubly difficult is the fact that the ordinance is not written clearly so many of the finer legal points will have to be decided in a court of law. Even if the employer wins the legal costs can break the bank. Why should we be concerned about lawyers writing this ordinance to benefit lawyers? 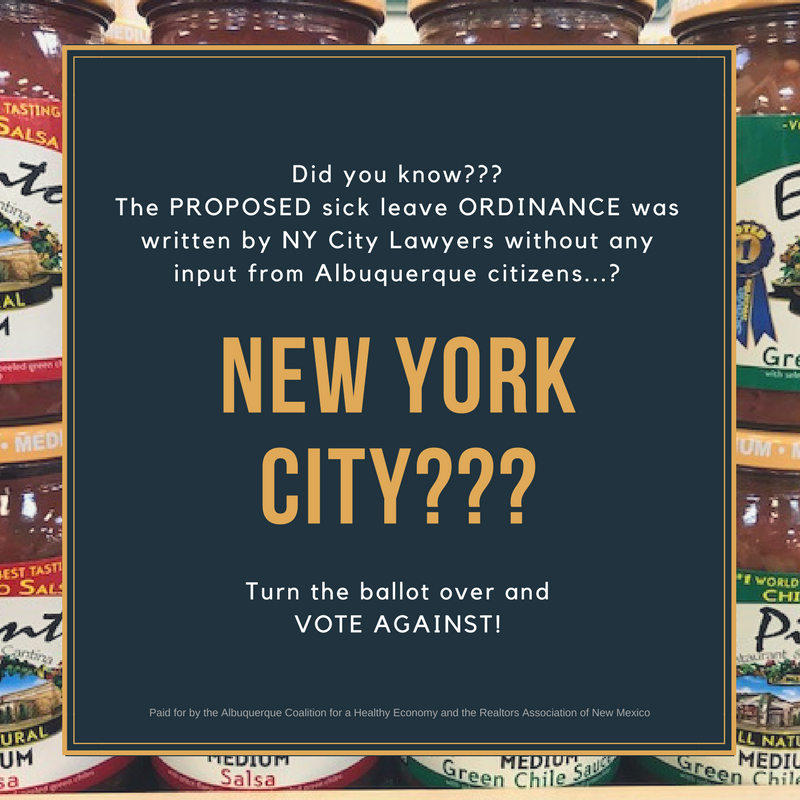 Because it isn’t simply sick leave being voted on in this seven page ordinance. The more convoluted the authors make this ordinance, the more money the author and his cronies can make off the backs of hardworking employers. Lawyers helping lawyers (it’s a sort of charity). To make things worse the law was written by New York lawyers who have no stake in our community and do not face the same realities we face in New Mexico. This fact came to light in the legal proceedings where the business community sued to keep the entirety of the language on the ballot for all to see and read. We don’t need NY lawyers here to make employers feel unsupported. New Mexico does that already with their burdensome regulations and crushing bureaucracy. This ordinance is just icing on the cake and a plaintiffs’ lawyers cash cow. In layman’s terms this means, if the employer takes ANY ADVERSE ACTION, including discipline FOR CAUSE, against an employee within 90 days of taking sick leave it is presumed the employer is retaliating against the employee for taking sick leave, which is a punishable violation under this ordinance and the employer has to go to court to prove otherwise. Here is another instance where this kind of legal jargon is meant to trip up employers. Under this law an employee, can take sick leave for: “An employee or employee’s family member’s mental or physical illness, injury or health condition; including medical diagnosis, care, treatment, or recovery; for preventive medical care; for closure of the employee’s place of business or family member’s school or place of care for public health reasons; or for absence necessary due to domestic violence, sexual assault or stalking suffered by the employee or employee’s family member, provided the leave is to obtain medical or psychological treatment, relocate, prepare for or participate in legal proceedings, or obtain related services. “Note that the definition of a “FAMILY MEMBER= A spouse or domestic partner; a child, sibling, parent, grandparent, grandchild, or legal ward or guardian of the employee or of the employee’s spouse or domestic partner (whether of a biological, foster, adoptive or step relationship), and the spouses or domestic partners of these individuals; a person to whom the employee stands or stood in loco parentis; or any other individual related by blood or affinity whose close association with the employee or employee’s spouse or domestic partner is the equivalent of a family relationship. 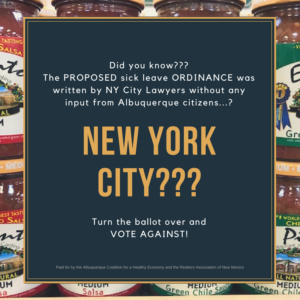 “This is just three paragraphs from the sick leave ordinance going to the voters of Albuquerque as I type these words. If this sounds too complicated to follow, try being a small business owner, an employer with say 5 employees who now has to write a new employee handbook using these definitions. Do you now have an understanding of how convoluted this ordinance is? Be aware! Beware! VOTE AGAINST!